About a month ago, we planted a basil plant in our little garden walkway. Normally I was buying fresh and dried herbs from the supermarket, and they were pretty expensive. I always assumed to grow your own little herb garden, it requires a lot of attention and care, but that’s not entirely true. Besides the planting and giving some fertilizer, that was it. The basil plant originally had about 18 leaves on it, it was sparse, but now it has hundreds as far as I can see. I was pretty amazed. Now when I need it for cooking, like I did tonight to make herb butter, I just went out, tore a few leaves off, washed it under cold water, and chopped it up. For someone who is lazy like me, this is awesome. Now I’m considering trying out thyme and rosemary in the garden, perhaps even cilantro. I mean, why not? My favorite part is tearing the leaves off and smelling the aroma. Such a pungent herb. 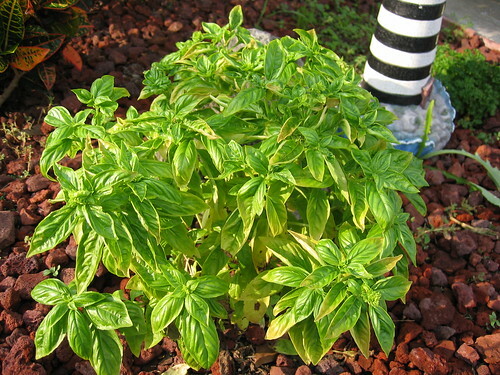 Wow, beautiful looking basil plant. Great job on the photo too, perfect lighting! Our little garden has about a dozen basil plants just going crazy like yours. Must be the right conditions for our area right now. Rosemary and chives are doing well too, but we didn’t have much success with thyme or sage. Just FYI, comrade. Good to know, thanks for the info Jack. I’ll have to give rosemary and chives a try next. I especially would like more chives in my cooking life, as they are awesome sprinkled over a baked potato.